PR seems like an easy thing to do. Right? Well, not so much. 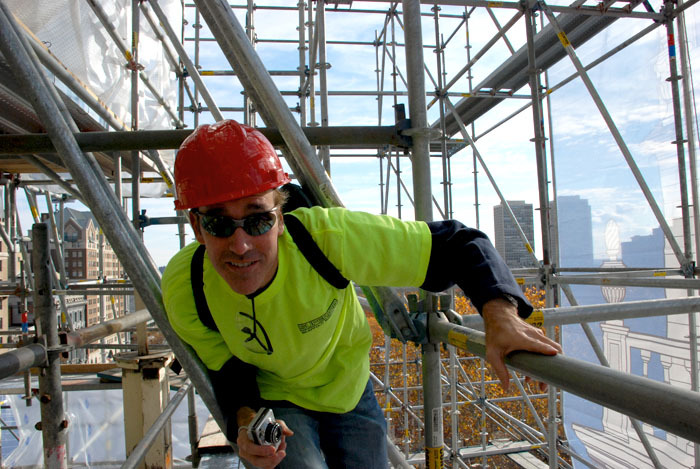 We are experts in scaffolding not getting press. But we did realize that is a vital part of our marketing mix. The more we can tell and show people about the work we do the better they will understand our business and in turn hire us. But how do you go about doing it? The key for us was the word ‘show.” We can have our engineers describe the architectural details all day long but what better way to showcase our work than to photograph it. That way, clients, customers and even general contractors can see just how good we are – especially on the historic projects where the utmost care is needed. We decided that the Independence Hall project would be the perfect opportunity to do just that. The first step was finding a photographer crazy enough to climb around the scaffolding we build. We found him in Erik Highland. Not only was his willing to go where most people never dared but seeing his work we realized that he could tell our story visually. He took some awesome shots of the scaffolding in place and then some of the decorative scrim being installed. You can see more of those images by clicking here. The shots told our story perfectly. But now what would we do with them? That was the million-dollar question. I’ll detail that in part 2. Posted on July 29, 2011, in News & Updates and tagged Advertising, article, frame, Marketing, News, photography, photos, pics, PR, Press, rentals, scaffold, Suspended, Swing, System. Bookmark the permalink. Leave a comment.